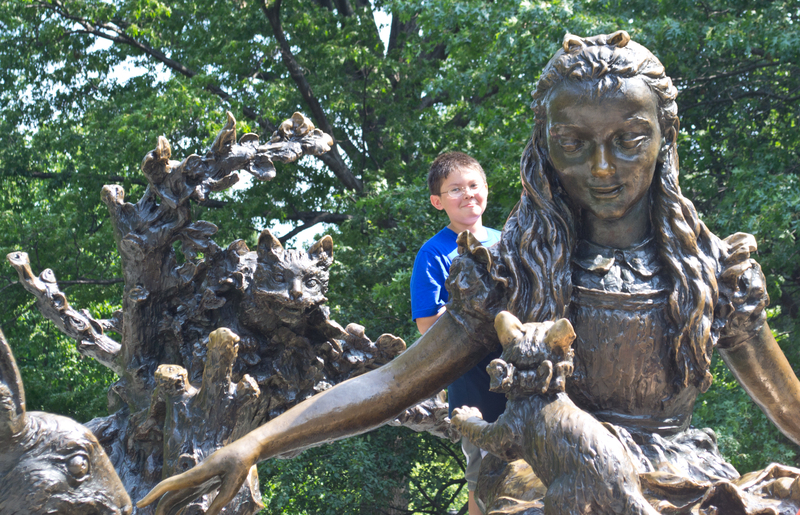 Dylan Shiveley discovers one of the clues along the way on our scavenger hunt. Mason Street at Belvedere Castle, the start of our hunt. 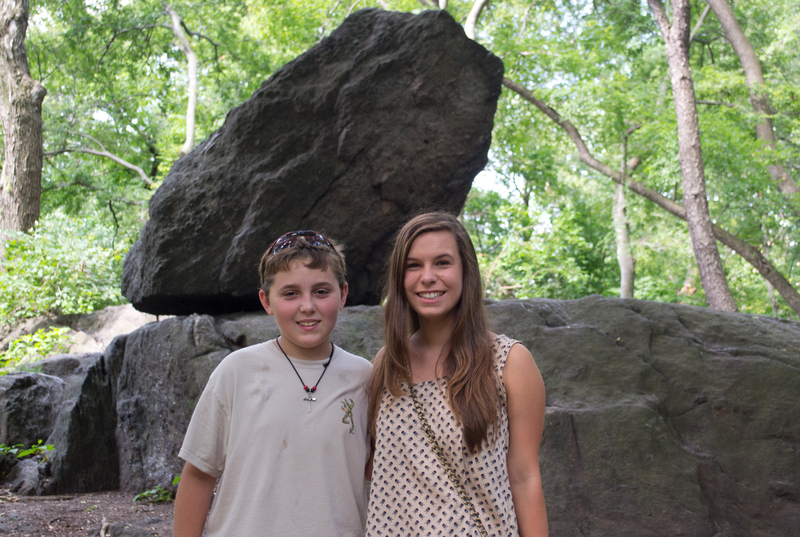 (New York, August 5, 2012) Today’s schedule called for a scavenger hunt in Central Park. We divided into two teams, each looking for a specific landmark, equipped with a map and Road Scholar guide. 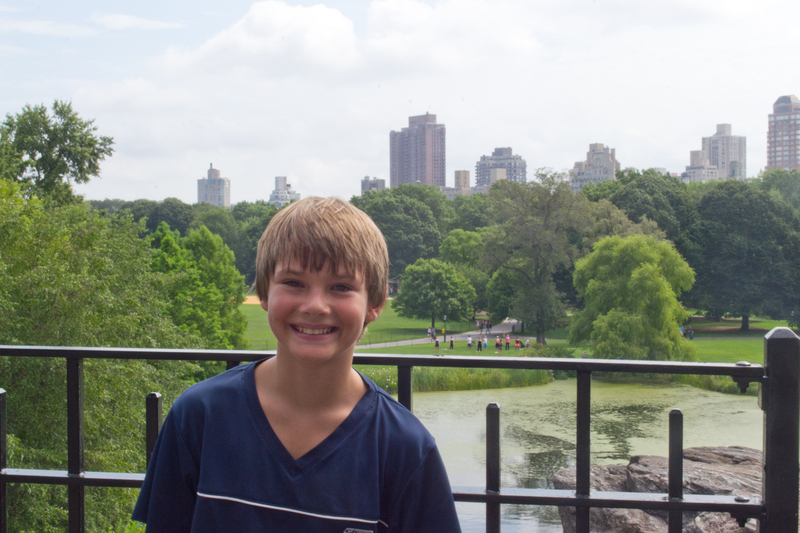 Our team, led by Eagle Scout John Moore, left Belvedere Castle heading generally south along the Rambles. Louis Pratt and Holley Tate-Wheeler trailside on the Rambles. Getting there, like they say, is half the fun. Well, maybe more than half. We passed a number of well-known landmarks like the Boathouse and statues of Christopher Columbus and William Shakespeare. We also discovered some lesser-known natural rock formations – Manhattan Schist, we learned – that were left behind by glaciers. 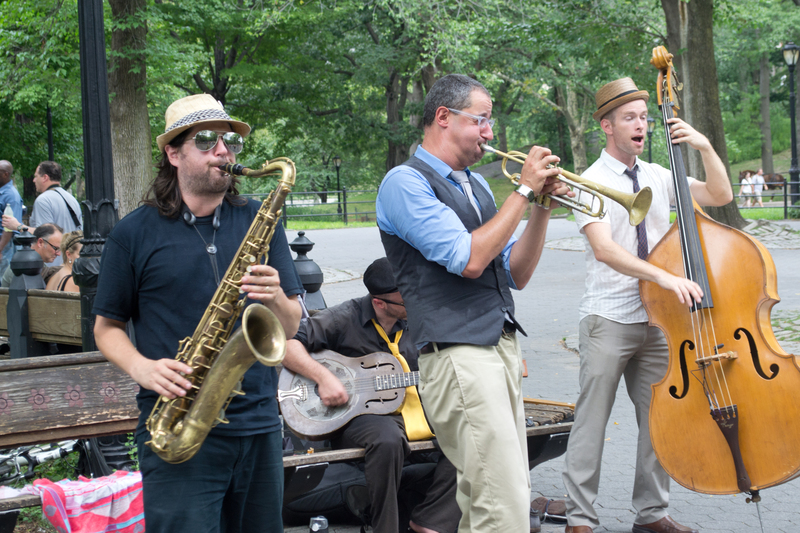 The lively blues of Tin Pan jazzed up Bethesda Fountain. 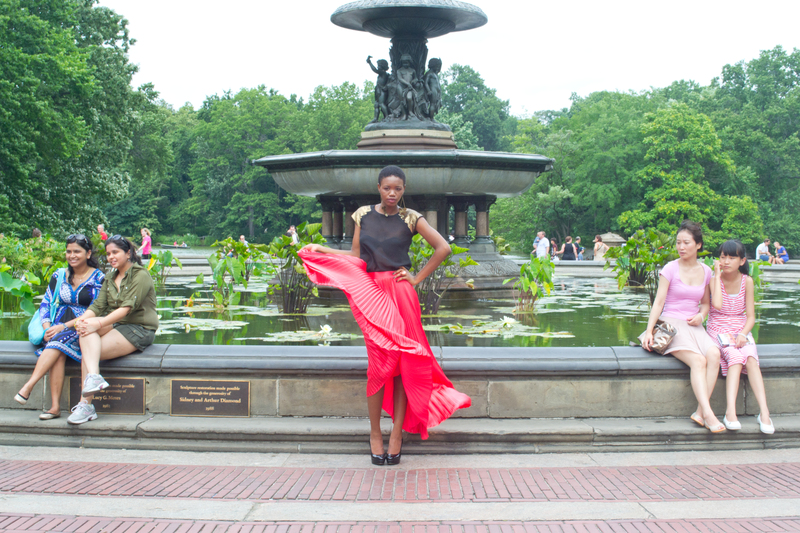 We also walked past other sights along the way – a wedding, musicians, and a fashion photo shoot. It seemed like everyone was out in the Park this afternoon, looking for fun or sharing their fun with others. We were tempted to linger and listen, or people-watch, but we were on a mission. For a short time, we Road Scholars were not the most glamorous people in Central Park. Finally, we found the landmark at the end of our quest – another secret we cannot reveal. You’ll just have to sign up for this program, along with your grandchild or grandparent, and see for yourself. So, with another successful afternoon under our belts, along with more terrific New York City food, we headed off to an evening in Manhattan on our own. 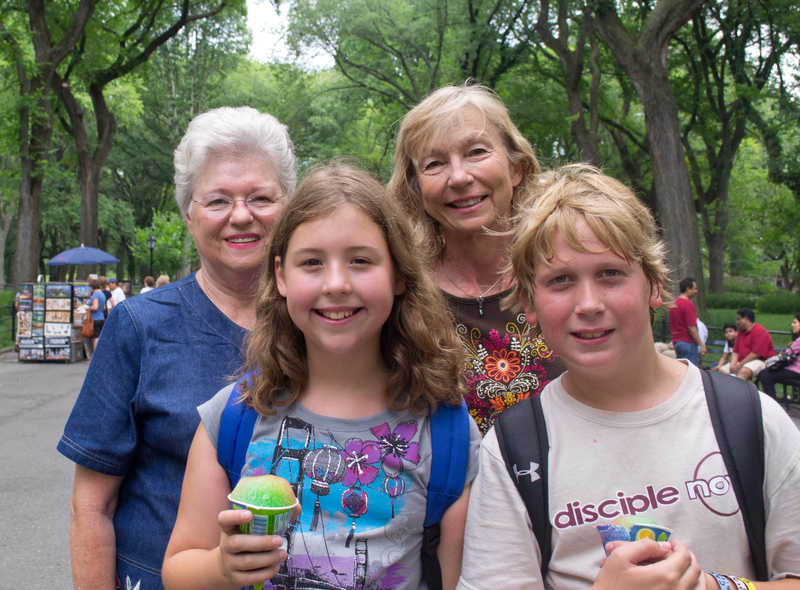 Joyce Bowen, Lucy Smith, Jan Green, and Bo Wheeler enjoy an Italian Ice at on the Mall at the end of our Central Park scavenger hunt. Tom is visiting New York City with Road Scholar gandparents and their grandchildren for a second time this summer. Videographer Cameron Kirkpatrick is also along for the adventure. Follow us as we enjoy the sights, sounds, and tastes of the greatest city in the world.